Chandrayaan-1 made it safe to the lunar orbit. It was the moment scientists at Indian Space Research Organisation (isro) had been waiting for. At the time of going to press, India's first mission to the moon was progressing closer towards its destination of orbiting the moon from a distance of 100 km. An instrument called the moon impact probe will later detach from the satellite and crashland on the moon's surface after a short 20-minute journey. The tricolour printed on its face will beam India's presence on lunar territory, a moment of victory for isro scientists monitoring the voyage of Chandrayaan-1. And a giant leap for India's space programme. India became the fourth country to place its flag on the moon, and ahead of China on this score. China launched its spacecraft into the lunar orbit about a year ago, but it did not place a flag on the moon.An ndtv report said, the idea of planting the flag was former President A P J Abdul Kalam's; he believed the tricolour should be planted early so that one day when lunar resources were going to be shared by the world community, India would not be left out of the race. Exploiting moon's mineral resources may seem futuristic, but that a colony on the moon was part of the plans was evident from the fact that none of the countries with space programmes ratified the international Moon Treaty, effective since 1984. This treaty prohibited owning of property on the moon either by countries or by individuals and put resource exploitation on the moon under the regulation of an international authority. India signed the treaty, but did not ratify it; 13 countries ratified the treaty, but none of them was a major space-faring nation. Though scientists and governments never publicly projected mineral extraction as an objective, the moon held out an answer to Earth's depleting resources. "It is very difficult to predict just what resources and technology will be most valuable 50 years from now, but it is clear that new resources will be needed, and the moon is the closest planetary body accessible to Earth," said Carle Pieters, geologist at Brown University, us, who participated in drafting American space administration nasa's report on Scientific Context for Exploration of the Moon, 2007. Mapping of the moon's minerals therefore became necessary for any future exploitation of its mineral resources. "Extraction of minerals is still a far cry. First we have to map the minerals properly. We still do not have proper maps that can give a clear picture of their location and abundance," said U R Rao, former chairperson of isro. With mineral extraction came the question of area demarcation and ownership of land on the moon's surface. The un embargo notwithstanding, Lunar Embassy, a us company based in Florida, claimed it sold land on the moon. The company boasted it was the only one to have legal authority to sell celestial property. The basis of its claim was that while the un Outer Space Treaty, the basic legal framework of international space law, barred nations from owning celestial property, the law did not bar individuals and corporations. The company's website LunarLandowner.com urged visitors to "buy moon property" from "Earth's leading lunar real estate agency". Lunar Embassy claimed it informed the un General Assembly and the us and Russian governments of its legal claim and intent to sell extraterrestrial property. The company registered the idea with the us copyright registry office. It also collaborated with a California-based company, TransOrbital Inc, which has got the us government's clearance for the first commercial mission to the moon. Property on the moon became a subject of international politics in 1979 when the un finalized the Moon Treaty and placed it before the international community. Activists and space advocacy groups in the us lobbied to defeat the treaty in the Senate as it forestalled colonization of the moon, an idea that had been circulating since the early 1970s and had among its supporters entertainer Bob Hope, singer-songwriter John Denver and oceanographer Jacques Cousteau. Another reason for lobbying against the treaty was the provision that any development, extraction and management of resources would take place under the supervision of an international authority that would divert a share of the profits, if any, to developing countries. L5 Society and National Space Institute were the frontrunners to campaign against the treaty. L5 Society hired Washington-based lobbyist and lawyer Leigh Ratiner, who gave intensive training to activists on "how to walk the halls of Congress and talk to staffers". When the us did not ratify the treaty, the then Soviet Union also refused. The race to the moon hotted up; an increasing number of countries that did not sign the Moon Treaty followed with their own missions. The treaty became irrelevant. "More and more countries are saying that they do not care for international law and are showing total disregard for multilateral agreements, said M V Ramana, an expert on nuclear weapons and energy programmes at the Centre for Interdisciplinary Studies in Environment and Development, Bangalore. By the turn of the century a base on the moon was on the agenda of all countries with space programmes. In 2000, China declared that it would create a permanent moon base with the intent of mining lunar soil for Helium-3. Helium-3 is believed to be a major source of energy in the future. The gas has been found to be embedded in ilmenite (FeTiO3), in abundance in lunar soil. nasa's plan was more long term. Its administrator Michael Griffin said at the International Astronautical Congress in Hyderabad in 2007 that nasa had plans to first go back to the moon, stay there for a substantial length of time and then proceed to Mars. Former isro chairperson U R Rao talked about possibilities of India setting up a temporary "habitation" on the moon, which could serve as a base for future space explorations and scientific studies. "It will be easier to send space shuttles from the moon because the mass of the space shuttle will be considerably reduced," said isro chief Madhavan Nair pointing out the advantage of setting up a base on the moon. Before a habitation could be set up on the moon, scientists needed to know if it could support life--whether or not there was water on the moon. Along with all this scientists needed to know how the moon developed. And these required a scientific study. The economic justification for all these efforts would be provided only if minerals were available in substantial quantities. 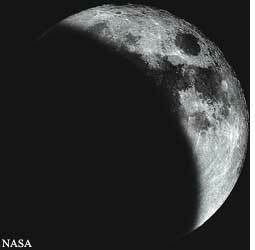 "The most enigmatic question about the moon is its origin," wrote Narendra Bhandari, scientist at the Planetary Sciences and Exploration Programme (planex) of Physical Research Laboratory, Ahmedabad, in a paper published in Current Science (June 10, 2004). He said the minerals present on the moon provided an insight into the manner in which it was formed and over what length of time. A chemical and topographical mapping of the moon would help understand the nature of its crust and the composition of the asteroids and comets that have bombarded the moon since its early days. Chandrayaan-I would help scientists prepare a mineralogical map and a three-dimensional atlas of the far and near sides of the moon which would give its topography. The mineralogical map would require high resolution remote sensing by photographing the moon with visible light and also with very high energy and very low energy rays not visible to the human eye. The minerals scientists would look for were magnesium, aluminium, calcium, iron and titanium. Radioactive elements like radon, uranium and thorium would also be studied. The maps for minerals, radioactive elements and chemicals would have to be superimposed on a topographical map of the moon to identify the locations that required thorough probing, said Bhandari. That was why a camera to map the lunar terrain had been included in Chandrayaan-I. Though these were the broad mission objectives outlined by isro, search for water was a major interest. According to isro, although samples brought back from the moon by other missions showed the terrain was extremely dry, recent findings suggested water might exist in its polar regions (see box Water, ahoy!). Scientists zeroed in on Shackleton crater close to the moon's southern pole. The crator was named after Ernest Shackleton, noted Antarctic explorer. "Shackleton crater is expected to have water-ice on its walls and at the bottom and would be a prime area of study," said Bhandari. Scientists needed a chemical or radiological proof that could establish the existence of water on the moon. minisar, one of the two us instruments (payload) on board Chandrayaan-I, would do the prospecting for water on the moon. Though much was reported in the media about prospecting for Helium-3 it was not mentioned on the mission's agenda. "Earlier missions had already identified Helium-3 on the moon. Now the task was to quantify the mineral. 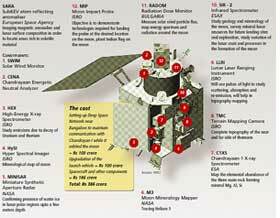 However, this mission did not have the instruments to quantify with," said U R Rao. Even if Helium-3 were found on the moon, argue some scientists, technology for generation of energy from Helium-3 was not available yet. "Generation of energy from Helium-3 required fusion technology and the world was still decades away from it," said M V Ramana. The mission to the moon was not specifically a mission to look for a future source of energy, rather "it was to establish that technologically India had the capability to do something there", said Chandrashekar Srinivasan, faculty at iim Bangalore and former isro scientist. Clearly excited about India's maiden mission to the moon, isro chief Madhavan Nair said "This is an exploratory mission. There are so many possibilities before us." Chandarayaan-I was launched into its two-year lunar voyage on October 22 by an upgraded version of the Polar Satellite Launch Vehicle (pslv). Developed in the 1990s with Russian collaboration, isro has been scaling up PSLV since 1999 when K Kasturirangan, then chairman, suggested it could be used to launch a moon-bound spacecraft. The pslv was earlier used to launch India's remote sensing and television broadcasting satellites. Unlike its launcher, Chandrayaan-I was made in India, its design included. The spacecraft, along with the instruments or payloads it carried and liquid propellants, weighed 1380 kg. As the rocket reached close to the moon much of the propellants were consumed in thrusting the rocket to its destination. Once the spacecraft was in the lunar orbit its total weight could be 675 kg. This included the two instruments or payloads from nasa and three from European Space Agency (esa) which either complemented or supplemented the data generated by the Indian payloads. Chandrayaan-I also carried a payload from Bulgaria (see box Devices aboard Chandrayaan-I). The foreign payloads came in black boxes and India had no access to these instruments. These payloads were sent after India sent out an invitation; they were selected on the basis of their compatibility with the Indian mission's objectives. Nair said this goodwill gesture by India was gratis. isro's gain was the data generated by these payload instruments, which could be accessed by India. The spacecraft along with the instruments would orbit at 100 km from the moon--the closest range achieved so far without landing on the moon. It would remain in the orbit for two years. "It is in some sense a race for better technology," said P V Inderesan former director of iit, Madras. What it has yielded are innovations that upgraded existing technology. At Rs 386 crore, India's first unmanned spacecraft is the cheapest so far for any mission to the moon (see box The cost). Nevertheless, its gains are not tangible enough to justify government spending without questions being raised. "A policy dialogue on the basis of cost-benefit analysis needs to be undertaken before an investment of this scale is undertaken. I see no space for that in the current state of things," said Ramana. He pointed out organizations like the Department of Atomic Energy and isro always got away with big spending budgets without proper justification for them. "It is not that we gained some specific technology from the mission. But it is a final demonstration that our technologies are capable enough to pull off a mission as complex as reaching the moon," said Ajay Lele, research fellow on space strategy at Institute of Defence Studies and Analyses. In other words, at Rs 386 crore India's scientific community regained its self-esteem. Sections of Indian scientists felt their self-esteem took a battering when following the Pokharan II nuclear tests in 1998 the West imposed sanctions against India. Scientists were one of the worst sufferers because they were denied access to technology and instruments from the West. They therefore needed to demonstrate they were capable of moving ahead without help from the West. "The Pokhran II sanctions definitely helped scientists develop their own technology to a level where such a mission was possible," said Lele. One year later, isro chairman K Kasturirangan announced in 1999 that Indian scientists wished to explore the moon. Narendra Bhandari, scientist at Physical Research Laboratory, Ahmedabad was allotted the task of formulating the scientific goals of the moon mission. In 2003, scientists from various fields recommended that India undertake a mission to the moon. In November 2003, the 24-month mission expected to create the first digital three-dimensional map with high spatial and altitude resolution of five metres received cabinet approval. The same decade, developments in Japan and China indicated that the race to space had now shifted to the eastern hemisphere. In January 1990 Japan launched its first moon mission. The Chinese also had three manned space explorations and one unmanned lunar exploration by 2007 (see box Hindi Chini space missions). The us -Soviet Union game of oneupmanship in the 1960s and 1970s was now replaced by the global need to collaborate so that space-faring countries did not have to reinvent the wheel. One of the first examples of collaboration was the International Space Station (iss) set up in 1998 in which 16 countries participated. It included the us, Russia and countries of Europe. Neither India nor China was part of it. Chandrayaan-I demonstrated India's coming of age in space technology. In an interview in the book, Destination Moon (Harper Collins), Nair spoke of India's intentions to be part of iss. The second major collaboration was signed in July this year between the us, Canada, Germany, Italy, Japan, South Korea, uk, France and India. These countries would work together on sending a series of robotic exploratory lunar missions to pave the way for a manned mission later. Evidently, collaboration was driven by the need to speed up the lunar search. Going by precedence, countries empowered with technology will not wait around for an inclusive arrangement once they had the technology to excavate moon's resources. The Moon Treaty referred to these future finds as "common resources". Rao said, "We are not clear what 'common resources' mean. Dialogues should start on what will be the method of sharing of minerals." In the same breath, however, the former isro chairman added there were miles to go before there was any question of resource sharing. "A lot remains to be done. More technologies were needed. But before everything else, the cost of moon missions had to be brought down--by at least 100 times." Rays of the sun reflected from the moon’s surface create radiations of different kinds. 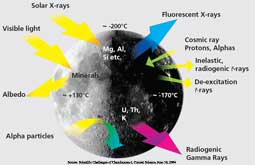 The kind of radiations created depends on the minerals on the surface of the moon. For example, solar X rays when they fall on non-radioactive minerals like Mg, Al, Si will produce fluorescent X rays. When visible light from the sun falls on radioactive materials, gamma rays are produced. Apart from the solar rays, moon also receives cosmic rays. These also produce different kinds of radiations depending on the chemical composition of the surface on which they reflect. The instruments on Chandrayaan-I will study rays like high energy X rays, infra red rays, alpha and gamma rays. Analyzing these rays will help in mapping the minerals on the lunar surface and also understand leakage of radon from lunar interior. The diagram also gives the temperature profile in the near (left) and far sides of the moon and also at the poles.